And behold, I saw a white horse. Its rider’s name was Success, and Envy followed him. Envy is a movement killer. And if you ask me, it is probably the fundamental danger facing the Young, Restless, and Reformed movement in the next thirty years. First a definition: Envy is a feeling of unhappiness at the blessing and fortune of others. In the words of Merriam-Webster, it is the painful and often resentful awareness of an advantage enjoyed by someone else. Envy, Solomon tells us, is a bone-rotting sin that sweeps us off our feet. In the grip of envy, we weep at those who rejoice and rejoice over those who weep. It’s a gnawing worm, a green-eyed monster, the relentless ache of the shriveled heart. At the same time, envy is a subtle chameleon with many faces. It masquerades as the smooth flattery of imitation one minute and righteous indignation at injustice the next. If you listen to the Old, Restless, and Reformed talk, they’ll tell you that 30 years ago, there was no Reformed “movement” to speak of. Sure, there were Reformed churches that preached the whole counsel of the sovereign God who saves helpless sinners with unfathomable grace. But there was no larger “movement” of God-centered theology and worship and preaching. In the grip of envy, we weep at those who rejoice and rejoice over those who weep. When the Bethlehem Conference for Pastors was started in 1988, there were only a handful of Reformed conferences nationwide. Now you can practically forego church altogether and just attend Reformed conferences year-round (I don’t recommend this). Now there are multiple organizations dedicated to planting biblically-rooted, Christ-exalting, sovereign grace-proclaiming churches in America and around the world. The faithfulness of men like Packer, Piper, and Sproul, as well as catalytic conferences like this one, has born much fruit. Now there are thousands of God-centered pastors around the country, pastors who share a God-entranced and gospel-shaped vision of life and ministry. There are hundreds of Christ-exalting professors scattered in colleges and seminaries nationwide. And there are thousands more in churches and colleges and seminaries who are eagerly preparing for whatever God has planned for them. And thanks to blogs, twitter, affiliated networks, the proliferation of solid publishing houses, and the rabbit-like multiplication of Reformed conferences, we can all know each other’s names. Which is why envy is such a danger for the Restless and Reformed, both young and old. When thousands of God-besotted men reflect on the same Scriptures from a similar theological viewpoint, we’re likely to reach similar theological and pastoral conclusions. Which means the questions easily become: Who will preach that message first? Who will preach that message best? Who will write that book or blog first? Who will write that book or blog best? Who will plant the gospel-centered church in that city first? Of the gospel-centered churches in that city, whose is biggest? Whose is growing fastest? Envy is a movement-killer because it makes koinonia impossible. It operates close to home; it assaults our nearest relationships. I’d venture to guess that few of us here envy the opportunities John Piper has to preach at conferences or write books. While we certainly admire and respect men like Piper and Carson and Mohler, we’re not grieved by their fruitfulness and success because, for better or worse, we put these men in a class of their own. Instead we begrudge the gifts, talents, success, blessings, and opportunities of that pastor across town or that professor down the hall. At the college and seminary level, envy rears its head when one of your classmates makes better grades, has more friends, is more likeable, is given more opportunities, is given better opportunities, is better-looking, more educated, more gifted, more popular, more intelligent, more esteemed, or more successful. Thankfully, the Bible is fully aware of this kind of platform envy and addresses it head on. In the gospel of John, the disciples of John the Baptist come to him with words that seem tailor-made to provoke envy. “Rabbi, he who was with you across the Jordan, to whom you bore witness — look, he is baptizing, and all are going to him” (John 3:26). This is John’s potential Saul moment. “John, you have baptized thousands, but Jesus is baptizing ten thousands.” John’s response is worth its weight in envy-fighting gold. Envy is a movement-killer because it makes fellowship impossible. First, he remembers where all blessing, success, and opportunity comes from. “A person cannot receive even one thing unless it is given him from heaven.” I still remember, as a college student, hearing J.R. Vassar preach from this passage and say, “Do not seek an achieved ministry. Seek a received ministry.” We kill envy when we remember that whether we succeed or whether someone else does is ultimately given from the God who reigns in heaven. And how dare we assault his wisdom by murmuring about the opportunities and success of others. Second, John remembers his role. He is the friend of the Bridegroom, the groomsman, not the Bridegroom himself. And the groomsmen rejoice greatly when they hear the voice of the Groom. Now most of us aren’t jockeying to replace the Bridegroom. We don’t want to be Jesus. But we sometimes act like we’re in a competition to be the best man. Which is why it’s so important to labor to rejoice greatly when we hear the Bridegroom’s voice in the voices of our fellow groomsmen. It’s Jesus that spoke through Jason Meyer a moment ago. It’s Jesus who will speak through Parnell and Reinke and Mathis and Bowers and Piper. What are we saying about our joy in the Groom if our reaction to his presence and hand on a fellow brother is to grumble, complain, or dismiss him? Finally, John’s joy is complete when the Bridegroom arrives and surpasses him. Where Christ increases, John is content to decrease. But are we? Are we content to decrease, when Christ increases through the ministry of another? Do we even acknowledge that Christ is increasing in the ministry of others? Or do we attribute their success to some other factor: their ambition, their compromises, and in our worst moments, to the efforts of the devil? I’m convinced that this will be the test for the Restless and Reformed in the next 30 years. So I invite you to take the test with me. The next time someone else is given an opportunity or a blessing that you wish was yours, how will you react? Will you murmur about it, or will you celebrate with them? Not just accept their success, but rejoice in their success, celebrate with their success, dance around and high five their success? When someone else is blessed by God, will you be filled with gratitude, or with carping rivalry? Will your heart shrivel with envy and bitterness, or will it swell and overflow with glad-hearted joy because Christ is increasing? When it comes to the ministries of others, will you be their biggest fan or their biggest critic? Because when another faithful ministry becomes a fruitful ministry, the envious pastor sees a threat, a rival. The gospel-driven pastor sees reinforcements. When it comes to the ministries of others, will you be their biggest fan or their biggest critic? May we who love the glorious gospel of the sovereign God not be consumed with envy or enslaved to the success of others, but instead may grace enlarge our hearts to rejoice in their opportunities and blessings, and may our joy be made complete when we hear the Bridegroom’s voice and see the Bridegroom increase in the gifts and talents and fruitfulness of others. 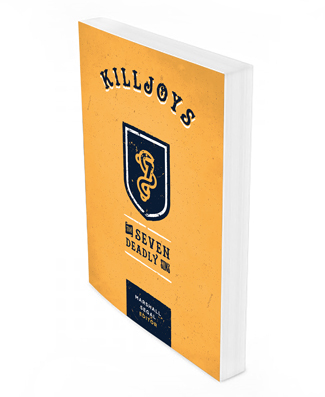 Joe Rigney contributed a chapter on envy in the book Killjoys: The Seven Deadly Sins. Electronic versions of the book are free of charge at desiringGod.org. Print copies are available through Amazon.